Food & Wine's Justin Chapple is sharing his July Fourth snack hacks and his recipe for a delicious Bloody Mary-inspired burger. He shows us how to make white chocolate-covered popcorn with red and blue decorations, star-shaped pita chips, patriotic ice pops and easy sliders. Put the ground beef into the re-sealable plastic bag. Press out as much air as possible, then seal the bag. Using your palms, flatten the ground beef into an even layer. Using a ruler or chopstick, make deep vertical impressions in the ground beef at 2-inch intervals. Rotate the bag and make the same impressions in the opposite direction to make a crosshatch pattern. Freeze flat until the beef is firm. 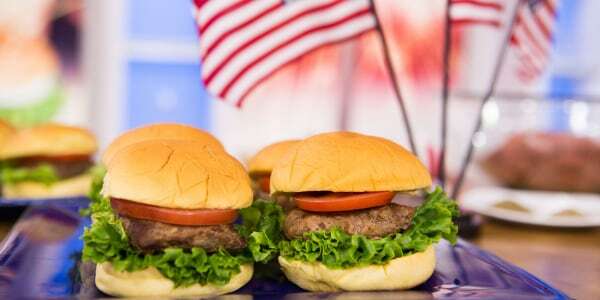 Snap the patties at the impressions to form the perfect little slider patties. Try this trick with my Perfect Bloody Mary Burgers. Mix the seasonings into the ground beef before adding to the bag and freezing. These juicy burgers incorporate all the flavors of the classic brunch cocktail favorite. It may seem like an odd combo, but tomato, Worcestershire, horseradish, celery seeds and hot sauce all go great with beef and make this burger a real standout. Arrange the strawberries and blueberries in the cups of the ice-pop mold. Fill each mold with 3 to 4 tablespoons of white grape juice to cover the fruit. Close the molds and freeze until firm, at least 6 hours or overnight. Un-mold the ice pops and serve. Using the cookie cutter, stamp stars out of the pita bread. Transfer the stars to a large rimmed baking sheet. Coat the pita stars lightly with olive oil spray and season with salt, pepper and dried oregano. Bake at 350°F until golden and crisp, about 20 minutes. Serve with hummus. On a large rimmed baking sheet, spread popcorn. In a large microwave-safe bowl, melt the white chocolate in 20-second intervals; stir between intervals. Drizzle the melted white chocolate over the popcorn and immediately scatter the sprinkles and the Pop Rocks over the chocolate. Let stand until the chocolate is set, then serve.